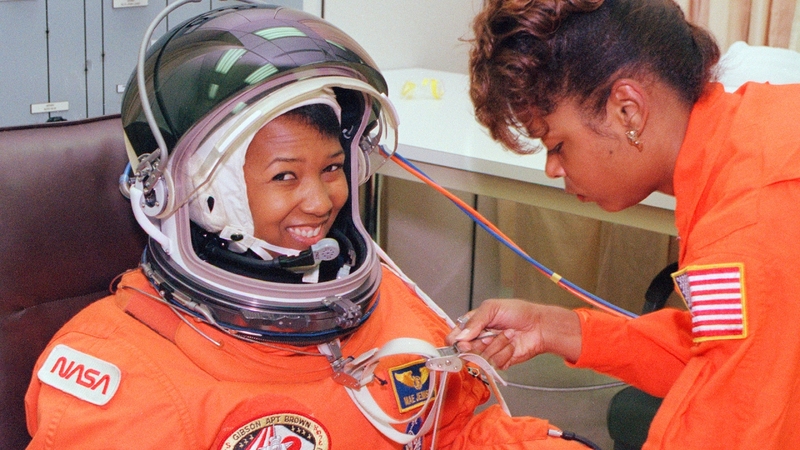 Mae C. Jemison: Engineer, Physician, Dancer, Astronaut, and Teacher. Born in 1956 in Alabama, but raised in the city of Chicago, Mae Jemison never planned to become an inspirational figure. Little did she know the impact she would have on the world around her. From early on, Jemison was making connections to science, and although her parents fully supported her science dreams, her teachers always did not. Yet she continues to follow her passions with a fierce determination. She found another passion in the world of dance and would continue to pursue her love of both the sciences and the arts throughout life. She graduated high school early at the age of sixteen and had to make the difficult choice between medical school and becoming a professional dancer. With the encouragement of her mother, Jemison attended Stanford University in 1973 and graduated four years later with a degree in chemical engineering and African and Afro-American studies. While at Stanford. she was an active member of the dance community and even choreographed a musical and dance production. “I think that people sometimes limit themselves and so rob themselves of the opportunity to realize their dreams. For me, I love the sciences and I also love the arts,” said Jemison (www.upclosed.com). Jemison then attended Cornell Medical College and graduated with her medical degree in 1981. While at Cornell, she traveled around the world, providing primary medical care to individuals in need. She also continued to take dance lessons at the Alvin Ailey School of Dance. Following medical school, she interned at the Los Angeles County USC Medical Center and worked there as a general practitioner. For the next two years, she served in the Peace Corps as the Area Peace Corps Medical Officer for Liberia and Sierra Leone, starting when she was just twenty-seven! While there, she also worked closely with the Centers for Disease Control and Prevention on research for various vaccines. Following her return to the United States in 1985, she once again worked as a general practitioner, this time at the CIGNA Health Plans of California. While working full-time, she was also taking graduate-level engineering classes in Los Angeles. Following the Space Shuttle Challenger crash in 1986, Jemison joined NASA’s astronaut corps, beating out two thousand other applicants. Strangely enough, her inspiration to join NASA came from her love of Nichelle Nichols acting on Star Trek. The show was one of the few places that she saw the representation of women, especially when up until that point most of NASA’s astronauts were white men. During her orbit in space in 1992, Jemison logged more than 190 hours of space time as the science mission specialist. “The first thing I saw from space was Chicago, my hometown. . . . It was such a significant moment because since I was a little girl I had always assumed I would go into space,” Jemison said (www.upclosed.com). She resigned from NASA in 1993 to pursue her interest in the practical application of the technology that she had spent so much time working with. Even before her resignation, she had served outside of NASA on the board of directors for the World Sickle Cell Foundation. Starting in 1995, she taught at Dartmouth College as a professor of Environmental Studies and was a strong advocate for science education. She also spoke often about the importance of getting more minority students interested in science. To her, technology was part of society, and minority individuals were integral members of that society. “Many people do not see a connection between science and dance, but I consider them both to be expressions of the boundless creativity that people have to share with one another” Jemison said (www.upclosed.com). Not only did Jemison found her own company, the Jemison Group in 1993, but she also was a member of several prominent scientific organizations. She founded the Dorothy Jemison Foundation for Excellence, a group that is devoted to encouraging students to think like scientists and foster their interest in the sciences. The programs she started also focus on getting students interested in current global problems. In 1999 Jemison founded BioSentient Corp, a company that works with NASA to commercialize some of their technology and other inventions. Today she is an active public speaker, providing inspirational and education messages to students everywhere. Although Jemison was never driven to be the “first black woman to go to space” and she never set out to become an inspirational figure, she does acknowledge that having been an astronaut gives her a great platform to share her knowledge. But more than just talking about her time at NASA or what she learned there, Jemison uses her platform to bring attention to important cultural and social issues. Mae Jemison has spent her life advocating for the advancement of women and minorities in the sciences. She encourages students to follow their dreams and to never sacrifice one passion for the other. Thanks in part to her, an entire future generation of scientists are entering their fields not afraid to follow their hearts and enter the unknown. “I want to make sure that that future that we’re creating is one that is the best it can be for people around the world, and also one that includes the full range of our talent and our skills—and you know, gender and ethnicity, geography—to solving the world’s problems,” Jemison said (www.npr.org).